We visited one recent Saturday to get a glimpse into the world of specialized music classes. 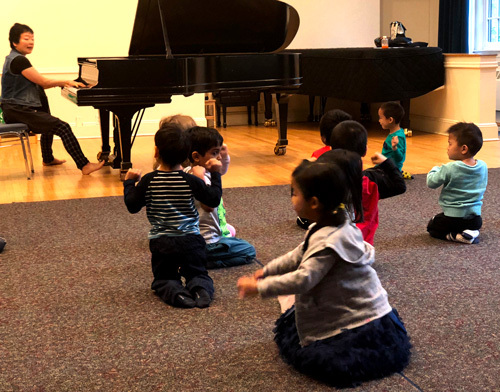 We first arrived at Getting to Know You: Exploring the Instruments For Threes, Fours, Fives and Kindergarten, taught by Danielle Miller and Yukiko Konishi. This class is hailed as a precursor to private instruction, and it's a great launchpad to pique a child's interest in and understanding of instruments. This week's instrument exploration was the piano led by special guest presenter Glen Kirchoff. The kids hovered around the grand piano and got to see its inner workings, examining piano parts and keys as they learned how the machine makes sound. They saw, touched, heard, and even smelled the piano pieces as they were passed around the circle. The other class we visited was Saturday Songs, taught by Danielle Miller. This class for threes and fours is focussed on rhythm, singing, and musical expression. After being called by name to sit in the circle, kids sing together, then each child gets to invent a four-beat clap/rest combination for everyone else to repeat. They learned the many ways beats and rests combine within a meter of music.